Book a Court Reporter in Boston! Our beautiful Boston facility has 4 conference rooms fully stocked for your use. Our largest conference room can accommodate 12 people comfortably. We offer a selection of amenities to choose from, including: beverages, refreshments and freshly baked cookies. We are pleased to provide our clients with access to free Wi-Fi during their visit. Our Boston court reporters are highly experienced and provide interactive realtime and deposition text streaming. Veritext legal videographers are equipped with the latest broadcast-quality video cameras and production technology, ensuring quality every step of the way. Interpreters, closed captioning and customized transcription services are also available at our Boston office. 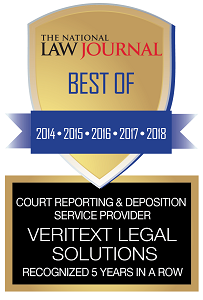 At Veritext, we take data security seriously and like all of our Veritext court reporting offices, our Boston office is HIPAA, PII and SSAE 16 certified. Read more on our Security measures. Our Boston court reporting office is also versed in managing complex cases that cover all areas of litigation, including securities litigation, intellectual property, pharmaceutical, environmental, commercial litigation, negligence, bankruptcy, employment law, antitrust and insurance cases. We’ve been the trusted court reporting company for many multi-party cases.